Freshwater fish tanks need heat or not according to the type of fish being kept. Cold-water specimens don't require a heater, but not all freshwater fish can survive in cooler waters: some freshwater fish are tropical or sub-tropical. The tropical fish require heat to survive in temperate regions and the sub-tropical ones can live in cooler water as long as it never gets too cold. Tropical fish cannot survive in water that is below 74 degrees Fahrenheit. The angelfish, the Australian rainbowfish, the Bala shark, the banjo catfish, the black neon tetra and the black phantom tetra, the black shark, the bloodfin, the blue acara and the blue danio are all examples of freshwater tropical fish. Tropical fish will generally need a heated tank, at least during cooler weather. Some fish are capable of withstanding a wide range of temperatures and are usually hardy in just about any region when kept indoors without an aquarium heater. Some, such as the common goldfish, can even be kept outdoors in temperate climates. Non-tropical fish include the clown loach, pufferfish, goldfish, koi and common guppy. The fancier guppies do better in temperate zones when kept in heated tanks, as they are more fragile than the ordinary feeder guppy. 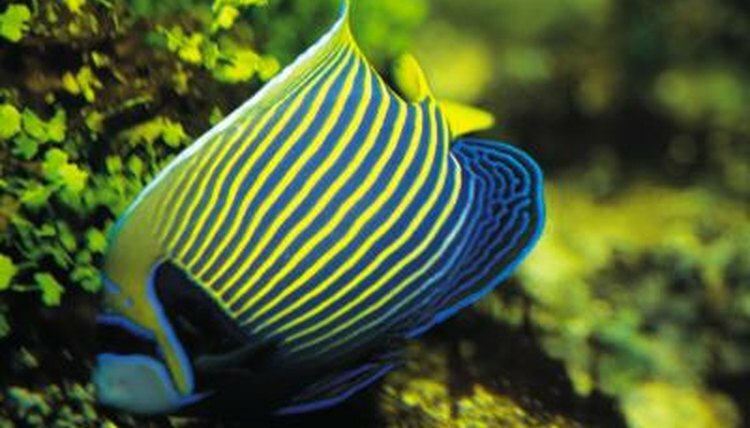 Sub-tropical fish are tropical but can tolerate slightly lowered temperatures. They come from places such as Florida, Arizona, southern China and India's northern highlands. In these places it is warm in summer and cooler in winter, although temperatures low enough to produce snow and ice are rare. Some examples of this type of fish are the freshwater blennies, the hillstream loaches, dragon gobies, ruby barbs and white cloud mountain minnows. When adding a heater to an established tank, use a thermometer to determine the temperature and set the heater a few degrees warmer. Every day, raise the temperature a degree. When you bring home new fish, float the bag containing the fish in the water for 20 minutes. This will equalize the water temperatures and prevent shock to the new fish. Treat protozoan infestations by raising the water above 86 degrees, doing it slowly to avoid harming the fish. Don't keep cold- and warm-water fish in the same tank, as this stresses both types. Rutgers.edu: Aquarium: An Ecosystem: Why Do Fish Need Optimum Temperature? Rutgers.edu: Aquarium: An Ecosystem: How Is a Constant Temperature Maintained? Rutgers.edu: Aquarium: An Ecosystem: What Is a Heater?